The large Pawtuckaway State Park is in southern New Hampshire, about equidistant from the cities of Concord and Manchester and the seacoast beaches. But in addition to its location, the park has a lot more to recommend it. 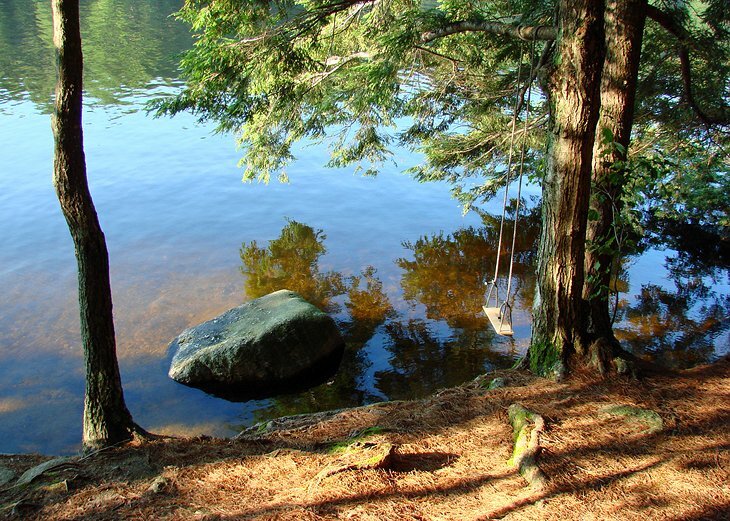 Many of the 192 wooded campsites have views of the lake, which has a very nice swimming beach, as well as canoe and kayak rentals and a boat launch. Showers and a camp store are added conveniences. In addition to campsites, there are five cabins, each one sleeping up to six people, with electricity, picnic tables, and campfire rings. Pawtuckaway State Park has a wide variety of hiking trails, leading to a low mountaintop with a fire tower, a large beaver marsh, and – its highlight – a boulder field strewn with huge glacial erratics that were dropped here by retreating glacial ice as it melted at the end of the Ice Age.